Erin M. Campbell represents clients in federal False Claims Act cases and other tort and contract matters. She is committed to protecting the rights of whistleblowers, who often sacrifice much to protect our Treasury, our service people, and our sick and elderly. She has tried cases with her colleagues and has extensive appellate briefing experience, including work on successful briefs to the United States Supreme Court and the Ohio Supreme Court. 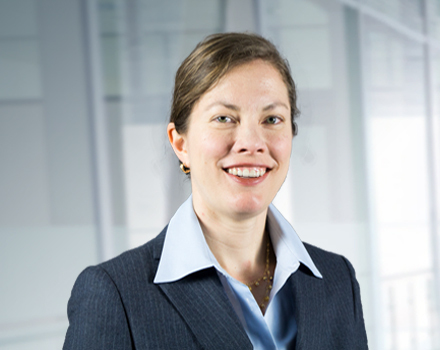 Erin M. Campbell also writes and presents on the False Claims Act. With James B. Helmer, Jr., she is co-author of Jury Instructions for False Claims Act Cases, a set of model False Claims Act jury instructions, to be published in the upcoming Volume 84 of the University of Cincinnati Law Review. The False Claims Act: Protecting Your Client When Amending a Sealed Complaint, written with co-authors Jonathan Kroner, Jennifer McIntosh, and Shankar Ramamurthy, appeared in the ABA Business Torts Litigation Journal (March 3, 2014). Also with Mr. Helmer, she co-authored Alternative Remedies Under the False Claims Act, published in 40 False Claims Act and Qui Tam Quarterly Review 113 (2006). She is also the author of Why Not Protect Our Elderly, Our Pensioners, and Our State Treasury? The Case for an Ohio False Claims Act, which was published on the University of Cincinnati Law Review’s blog on March 18, 2013. She is a contributor to the fifth and sixth editions of Mr. Helmer’s treatise, False Claims Act: Whistleblower Litigation. She has presented on the False Claims Act on several occasions to groups at the Cincinnati Bar Association and elsewhere. While in law school, Erin M. Campbell served as a legal extern with the Clermont County Public Defender’s Office and as a judicial extern with retired United States Magistrate Judge Timothy S. Hogan. She is admitted in Ohio, the Southern District of Ohio, the Fifth Circuit, the Sixth Circuit, the Eighth Circuit, the Ninth Circuit, and the United States Supreme Court. She is a member of the Potter Stewart American Inn of Court and Taxpayers Against Fraud. In 2010, Erin M. Campbell was selected as a Rising Star Superlawyer by Law & Politics magazine. She has worked on cases involving more than $1 Billion.